The Wolf Pack is back for their third and final installment of the Hangover movies. Phil (Bradley Cooper), Stu (Ed Helms), Doug (Justin Bartha) and Alan (Zach Galifianakis), after a successful duo of movies, try to make it three hits in a row. But do they retain the magic? 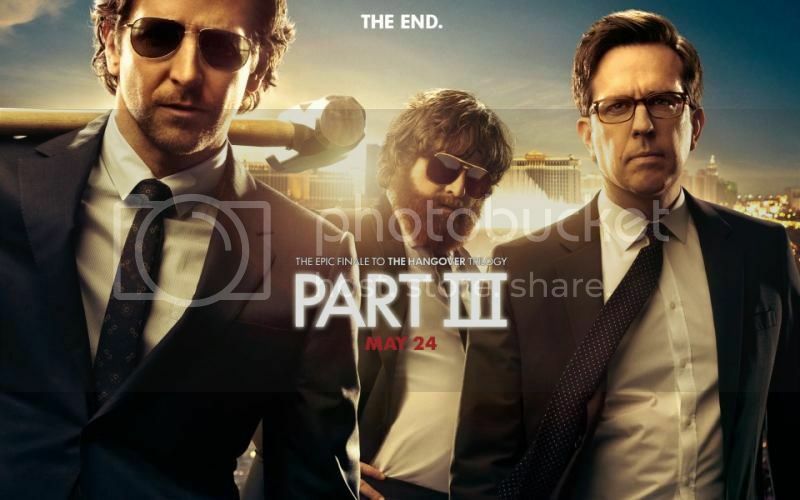 The Hangover 3 was always promoted as being the last movie, “The End” they called it. I wasn’t quite sure if they meant that the story is done, or they just want to kill off and end the franchise altogether. Because after watching the movie, it kind of felt like the latter. This is the movie’s biggest weak point. The movie is all about the wolf pack trying to make an intervention for Alan since he’s being himself. They get mixed up with some mafia or gangster folks. Then someone gets kidnapped, and they need to look for Mr. Chow (Ken Jeong). As usual, they end up in Vegas and that’s where their adventures start to play out. It’s called The Hangover… so you would come to expect something that at least resembles a Hangover. But that doesn’t come. Spoiler warning: At least not until the very end. I have no idea what happened here. Everyone seems like they really weren’t into this movie. The acting falls flat. They give too much screen time to Mr. Chow who doesn’t really pay off since he’s more of a “comic relief” character. I don’t know what else to say. They really dropped the ball. The plot is weak. The jokes are lame. The funny scenes are forced. What made the previous movies so successful is nowhere in sight. I did not enjoy watching this movie. The only bright side to all of this is that The Hangover ends with a BANG! But that’s about all. If I had to summarize the good parts of the Hangover, it would be a combined 4 minutes in 2 scenes, Spoiler: the very first, and the very last. If you have time to watch a movie I would recommend watching something else like Fast 6 or Star Trek. The Hangover is from Legendary Pictures and distributed by Warner Bros. Pictures. This comes out in Philippine theatres today, May 29.